Rising Nigeria 2015 is an Investment Guide Report published by Global Group Media giving background and information on the opportunities available to global readers and investors in Africa, starting with Nigeria. The Federal Republic of Nigeria is one of the fastest growing economies in the world and an important investment destination. Due to its oil wealth and large population, Nigeria has now become the 24th largest economy in the world and the largest in Africa. By 2020, it is envisioned to be listed among the world’s top 20 nations. 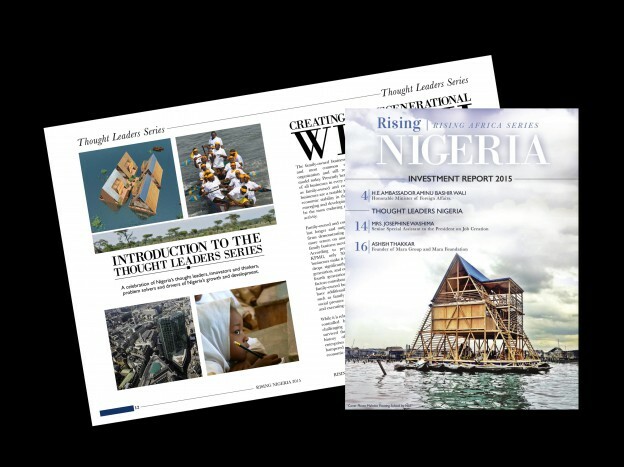 Makoko Floating School by NLÉ is featured on the cover of the report and as a part of Thought Leaders Series that can be found on pages 12-13.